Brent Ruoff, MD, was selected to receive one of two Missouri College of Emergency Physicians’ (MOCEP) R.R. Hannas Physician of the Year Awards. 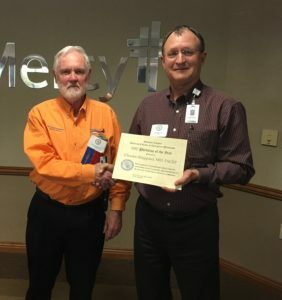 He received a double nomination from his peers, Gary Gaddis, MD, and Evan Schwarz, MD, at Washington University School of Medicine in St. Louis. Dr. Ruoff is the Chief of the Division of Emergency Medicine and Associate Professor of Emergency Medicine at Washington University School of Medicine. He is a graduate of St. Louis University School of Medicine, where he also completed his residency program. Dr. Ruoff’s list of accomplishments over his career are impressive and include: receiving three Emergency Medicine Residency Golden Apple Awards for Outstanding Lecturer between 2001 and 2008; receiving the 2014 Distinguished Faculty Award for Distinguished Clinician from Washington University School of Medicine; serves on many committees; and has published numerous peer-reviewed publications. He is Board Certified in Emergency Medicine from the American Board of Emergency Medicine and Board Certified in Internal Medicine from the American Board of Internal Medicine. Instrumental, meticulous, leader and commitment are just a few words used to describe Dr. Ruoff by his nominating peers. His hard work was instrumental in laying the foundation for clinical operations to support the development of the Emergency Medicine residency program at Washington University. He provides support that allows faculty to grow and pursue advanced training, often at the expense of his own academic career, while also being active in the community. His many efforts to meet the needs and wants of a disparate group of physicians leads to the harmony and shared mission of his Division. Charles Sheppard, MD, FACEP, was selected to receive one of two Missouri College of Emergency Physician’s (MOCEP) R.R. Hannas Physician of t he Year Awards. 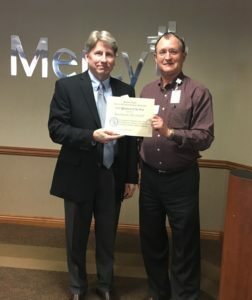 He was nominated by Ted McMurry, MD, FACEP, of Mercy Hospital, Springfield. In addition to being an emergency medicine physician, Dr. Sheppard is the Medical Director for Mercy Life Line Air Medical Service. He is a graduate of the University of Missouri – Columbia, School of Medicine, and completed his residency at the Presbyterian Hospital in San Francisco, Calif.
Dr. Sheppard’s list of accomplishments over his career are impressive. He completed a Fellowship in physiology for research in space medicine at the University of California at Berkeley; is licensed to practice medicine in four states; is Board Certified in Emergency Medicine from the American Board of Emergency Medicine and Board Certified in Internal Medicine from the American Board of Internal Medicine; is a fellow in the American College of Emergency Physicians and the American Academy of Emergency Medicine; and is active with many associations specializing in both air medical and emergency medicine. Dr. Sheppard has been an active educator on both a local and national level, giving presentations at numerous symposia representing the specialties of emergency medicine, trauma, EMS, and aeromedical transport medicine. In 2012, he recieved the AMPA President’s award for contribution to educational programs. He is a favorite attending for medical students, physician assistant students, and paramedics rotating through the ED. Equally impressive is his continued quest for self improvement and self education, and the willingness to pass this on to his colleagues and emergency medicine professionals. His dedication has continued throughout his entire career and shows no sign of slowing after his 30 years in emergency medicine. Melissa Kroll, MD, was selected to receive the Missouri College of Emergency Physicians’ (MOCEP) R.R. Hannas Resident of the Year Award. She was nominated by her peer, Daniel Lackey, MD, from the Barnes-Jewish Hospital/Washington University Emergency Medicine Resident Program. Dr. Kroll was nominated for her adaptability, patience, enthusiasm, efficiency, and ability to quickly develop creative solutions to problems as they arise. 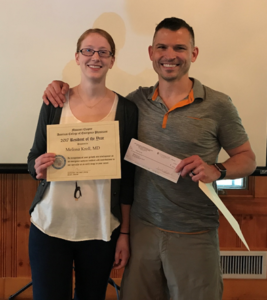 Most notably, she was nominated for her passion within the residency team, the compassion she shows to patients, and the praise shown to the ED nursing and support staff. She is involved with planning social events for the residents, and leading the Diversity Dinners with the intent to build understanding and camaraderie among her peers and the community. She recently coordinated a faculty and residents tour of a St. Louis refugee settlement organization to learn more about the challenges and resources available in the St. Louis area. The R.R. Hannas Award is presented to an emergency medicine physician and resident each year, and is named after Dr. Ralston R. Hannas, a “founding father” of Emergency Medicine. Dr. Hannas is a past president of the American College of Emergency Physicians and was the co-organizer, with Dr. Wiegenstein, of the first Scientific Assembly in 1969. He was also chairman of the committee that founded the American Board of Emergency Medicine, served on the Board for 12 years and was the organization’s fourth president. Dr. Hannas was also instrumental in helping organize the fifth Emergency Medicine residency program in the country, at Northwestern University, in 1973. In 1976 he moved to Kansas City where he practiced emergency medicine for 21 years.